Lucian Wintrich is a 28-year-old conservative from New York City. He is a fast-talking yuppie, but he is not the same breed as the average city know-it-alls. He is a conservative, and his support of Donald J. Trump is so extreme that he held an art exhibit in his honor on Saturday. Wintrich is a non-stop person who appreciates the fun of participating in ventures. At 15, he started his first magazine. At 16, he started an incredibly profitable import/export business that catered to upscale buyers and interior decorators. 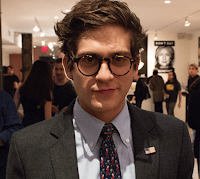 While attending Bard College, Wintrich produced a free speech publication. After completing his studies, Wintrich joined the advertising world, where he enjoyed his work and was very successful. However, this came to a screeching halt when he was fired by his boss because of his outspoken opinions. After Wintrich was ousted, he took a long, hard look at the art community in the Big Apple. He noticed that it was overrun with liberals, and he wanted to insert his conservative, Goldwater-loving spice into the mix. He crafted the idea for the #DaddyWillSaveUs art show, a glorification of Trump presented through mixed-media artwork. Created out of out of love for Trump and out of hate for the liberal dominators of art, #DaddyWillSaveUs was to be held at Manhattan's Pierogi Gallery. They backed out at last minute, likely because of pressure from the leftists in the community. Wintrich was angry, but he was relieved because he was able to find a new venue. #DaddyWillSaveUs was a success. Wintrich explained that it brought conservative artists together as one, including the likes of Milos Yiannopoulos and Martin Shkreli. Considering how controversial Shkreli is, I was shocked that he was included. Wintrich explained that he is a genuinely hilarious and logical person, and that they greeted with a "big hug." The exhibit received no commendation from Trump or his campaign. Wintrich explained that in today's political universe, Trump needs to stay clear of endorsing the outlandish. He said that the media will turn a blind eye to every misdeed that Hillary commits, but dig dirt on Trump so that they can gouge him. More than supporting Trump through art shows, Wintrich is interested in promoting personal freedoms, blocking the government's scope from growing, and making sure that culture isn't limited. He sees conservatism as the vehicle for protecting his free speech and Liberty, and he wants to spend his life defending it.